Mappa Mundi in association with Theatr Mwldan on tour. If it’s Wednesday it must be The Importance of Being Earnest; that at least has been the pattern of my week just past. I saw Middle Ground’s Earnest in Mold last Wednesday and Mappa Mundi’s in Bangor exactly seven days later. There were a few points of similarity between the two. Peacocks called loudly in both and neither of the Lady Bracknells could bring themselves to utter the word “handbag”. That’s about it though. Middle Ground’s was a perfectly decent, if un-exciting, touring production with some good, workmanlike performances and a show-stealing turn by George Telfer as two contrasting butlers. Pleasantly enjoyable but nothing more. Mappa Mundi on the other hand gave us Wilde’s play and a whole other layer as well. From time to time the lighting went all dramatic, the music swelled and Victorian melodrama burst onto the stage. Bringing Wagner, Elgar and OTT attitudinising into such a delicate structure as Wilde’s comedy of manners should have destroyed it utterly. But it didn’t. Far from it in fact. It actually made it even clearer just what a superb construct the play is. Its complicated plot works from beginning to end, every revelation is perfectly timed and placed. What particularly impressed me was how superbly everyone played all the production’s levels of unreality. After making an entrance like the stateliest of Wagnerian battleships, to wild, slow-motion cavortings from the other characters, Christine Pritchard’s fine Lady Bracknell half-turned and instantly transformed herself into a drawing-room dragon, still formidable but on a domestic scale. Every time we were allowed a glimpse of these Victorian theatrics, including one-upmanship curtain calls at the end of each act and caption cards to inform us of vital plot points and mood changes, the results were startling, ravishing and hugely entertaining. But then so was the play proper. An occasional line got swallowed up in the speed of it all but for the most part Wilde’s wonderful witticisms, bon-mots and paradoxes could be clearly heard. They were very well enunciated, exquisitely timed and even the most familiar of them got the laughs they deserved. In fact one, about curly hair, got a much larger laugh than usual thanks to the deliberately visible, multi-tasking performance of the wig it was addressed to. Meilyr Sion and Liam Tobin were splendidly antagonistic friends as Jack and Algernon. Mali Tudno Jones and Lynne Seymour were equally strong as Gwendolen and Cecily, particularly during their verbal duel over tea and cake. Rhian Morgan’s prim Miss Prism and Christopher Morgan’s vague Canon Chasuble were clearly heading for a marriage of like minds. It was a lovely idea to transform Merriman the butler into Merriman the maid and Lizzie Rogan gave her a fine comic put-upon air. Lloyd Llewellyn-Jones did an excellent job as both director and designer. This was a production with bite, zest and a bubbling sense of fun, directed and played with sublime precision. It looked absolutely wonderful too. 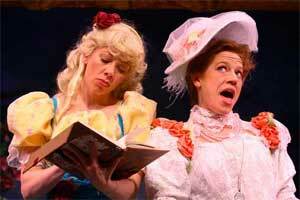 Middle Ground showed its audience that The Importance of Being Earnest is a good play. Mappa Mundi showed its packed house that it’s actually a great play and great theatre too.